The Giants swatted three two-out, two-run homers -- one by Hunter Pence in the fifth and two by Trevor Brown, in the sixth and eighth -- to defeat the Rockies, 7-2 , at Coors Field on Tuesday night. Right-hander Jeff Samardzija (1-0) provided an eight-inning, 111-pitch outing the Giants envisioned when they signed him to a five-year, $90 million contract during the offseason. He struck out five -- including reigning National League Player of the Week Trevor Storythree times -- and yielded six hits in eight innings. He also kept a Rockies team that had hit 17 homers in its first six games in the ballpark. It was just the second homerless start in the last 11, dating to last season, for Samardzija. "This is the kind of stuff he has," manager Bruce Bochy said of his starter. "He's a guy that just goes with confidence. When he knows he's on top of his game, he attacks the hitters on both sides. He's a competitor. And to go eight innings -- I was thinking maybe six, seven, but I couldn't take him out. He just got better as he went." Pence's homer and the first by Brown marred the outing of Rockies starter Tyler Chatwood(1-1), who gave up 11 hits but had chances to escape with fewer than the five runs charged his way in six innings. "The biggest thing is it cost us the game; that's the hardest thing to swallow," Chatwood said. "But I can build off it, keep going forward, see what happened and go from there." Brown took Jason Gurka deep to achieve his first career multi-homer game, giving him three hits for the season -- all homers. The Giants extended their club-record streak of games with a homer to start the season to eight. "If I was thinking about the entire season, I would have thought I might end with three homers," Brown said. "And -- knock on wood -- I might still end with three, but I certainly didn't think my first three hits were going to be home runs." Two-out rallies: The Giants touched Chatwood for a pair of two-out rallies in the fifth and sixth innings. 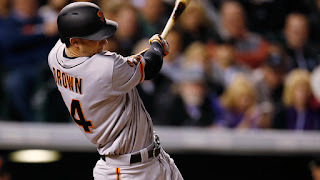 Joe Panik kept the fifth inning alive with a two-out double over third base and down the left-field line, setting up Pence's go-ahead blast, and Angel Pagan used his speed to beat out a possible double-play grounder in the sixth, saving an at-bat for Brown that padded the lead. 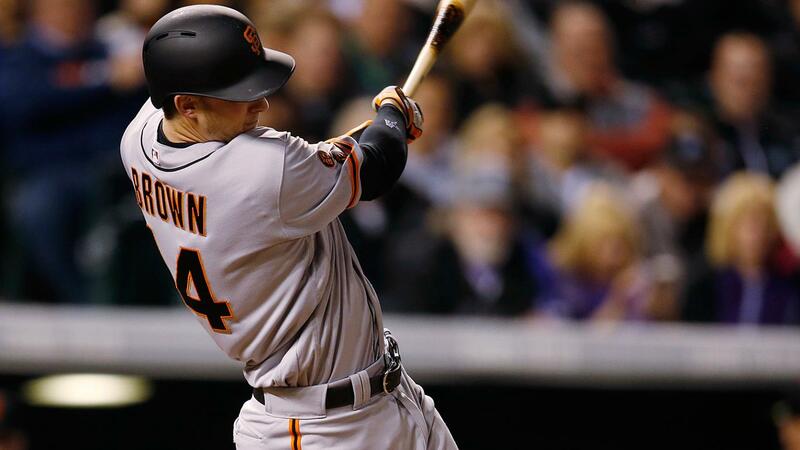 Pagan was at it again in the eighth with a two-out single to set Brown up for an encore. Gambled and lost: With two on and two out in the fifth, Nolan Arenado popped a Samardzija pitch into no-man's land in shallow left. Charlie Blackmon scored from second, and third-base coach Stu Cole didn't hesitate to send Carlos Gonzalez, who was coming from first. However, Giants left fielder Pagan beat Gonzalez with an accurate throw to the plate. "The ball fell in, and Angel did a great job recovering and made a great throw there," Bochy said. "That could have really done a lot of damage, and they're still hitting. There's no question that helped save the game there with that throw. It saves pitches for Jeff. Defense can win games for you, and that certainly helped." End of Story: Samardzija held Story hitless for the first time in his career. He challenged the rookie with a four-seam fastball on the first pitch he threw him, then threw nothing but sinkers and cutters, earning a groundout and three straight strikeouts against the rookie phenom. "I threw him a couple really good 0-0 pitches that had to put him in swing mode," Samardzija said. "When you go 1-0, 2-0, he can be a little more selective and look for something over the plate. But if you're putting him 0-1, making good pitches after that, it puts any good hitter on his heels. I wasn't throwing him anything straight after the first pitch. I was going to show him one straight one at the beginning, and after that, he would have to guess whether it was a cutter or a sinker, because he's just too hot right now." Story ended the game without a hit or an RBI for the first time in his career. Granted, it's just seven games, but with seven home runs and 12 RBIs in the first six, that's saying something. Too much and just right: A career of highlight-reel throws helped lead the Rockies to sign left fielder Gerardo Parra for three years and $27.5 million. He tested the arm twice in the third inning. The first time, however, he overthrew the cutoff and was off the mark on a throw to the plate when Denard Span scored on Pence's single. The throw let Pence take second. Parra, however, atoned by throwing Pence out at the plate on Belt's single. According toStatcast™, Parra's throw clocked at 94.3 mph and traveled 231.1 feet. "He painted and he didn't make too many mistakes. When you pitch like that, you're going to have good games. We didn't have too many opportunities and he didn't work with many tough situations." -- Rockies outfielder Carlos Gonzalez on Samardzjia's effectiveness. "He's just a good player that keeps getting better and better. I always felt even when he first got to the big leagues, the offense was going to come because he works so hard and he's got a great feel for the game." -- Rockies manager Walt Weiss on second baseman DJ LeMahieu, who has at least one hit in all seven Rockies games and is two games shy of his career-best. Giants: Jake Peavy (0-0, 7.20) makes his second start of the season Wednesday at 5:40 p.m. PT. He earned a no-decision Thursday in a game the Giants went on to win over the Dodgers. He pitched five innings and allowed four runs on 10 hits while walking none and striking out three. Rockies: Righty Jordan Lyles (0-1, 13.50) will be trying to eliminate the taste of a bad first outing -- 3 1/3 innings, five runs against the Padres -- when he faces the Giants on Tuesday at 6:40 p.m. MT.